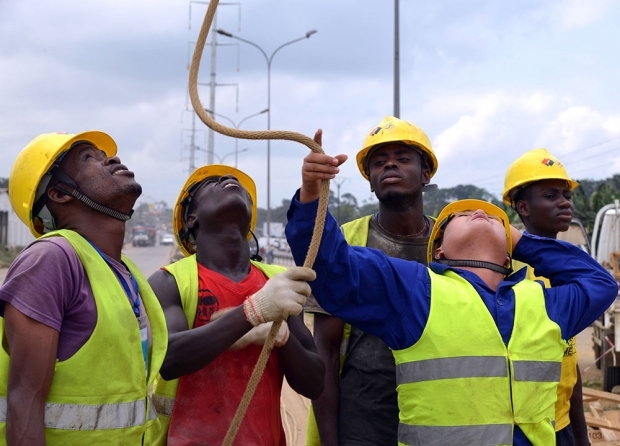 A Chinese engineer from PowerChina and Sinohydro works with Ivorian workers from Ci-Energies on a building site of a high-voltage power line on July 27, 2015 in the district of Yopougon in Abidjan, Côte d’Ivoire. The tremors in China’s faltering economy are being felt across Africa. Now that China has replaced Europe and the United States as most African countries’ largest trading partner, there is understandable concern that slowing demand in the P.R.C. will be felt in Africa’s commodity export dominated economies. The fear is real. Already, some Chinese-owned copper mines in Zambia have announced lay-offs, central banks were forced to spend heavily to shore up their currencies following Beijing’s surprise 4 percent devaluation of its currency this summer, and now African leaders worry that many of the planned Chinese-funded infrastructure projects may also be in jeopardy. While there is no doubt good reason for African leaders to be worried, a growing number of analysts contend the Chinese economic threat is highly exaggerated. As domestic growth slows at home, more and more Chinese companies will be looking abroad, particularly in Africa, for new growth opportunities. This combined with cheaper Chinese imports of phones, steel, and other finished products could help temper African inflation. Finally, let’s not forget that even as its economy slows, China is still the world’s second largest economy, and as such, it will still need a lot of African oil, agriculture, and vast amounts of other raw materials. So what accounts for these divergent narratives of the impact China’s slowing economy will have on Africa? No doubt, the media plays an important role. Much of the news coverage from international news agencies (mostly in the west) has been especially negative about Chinese economic prospects in Africa. The Financial Times, Wall Street Journal, and Reuters, among others, have run numerous stories with grim headlines and dire predictions. Conversely, African media, by and large, has been much more pragmatic by avoiding the sweeping narratives common in western media and instead focusing more of their coverage on the steady stream of announcements about Chinese-funded infrastructure and billion-dollar development deals that ironically seem to have picked up pace in recent months. This week, Eric and Cobus discuss why there is so much confusion in understanding how China’s economic difficulties may or may not be felt in Africa and why the media’s coverage of this issue is so confusing.